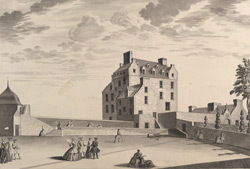 Drawing by John Elphinestone (1706-1753), thought to be Castle Lyon at Dundee, now known as Castle Huntly. As such, it is a companion piece to Elphinstone's series of illustrations of Glamis Castle. Castle Huntly, aka Castle Lyon, was part of the Glamis estate between 1614 and 1777, and served as the 'jointure house' of the owner's wife. This drawing is important as the earliest significant illustration of Castle Huntly, the only one predating the major reconstruction that began in 1778. It is thus an important source for understanding how this campaign changed this important building, and also for understanding the nature of the earlier rebuilding by the 1st and 3rd Earls of Kinghorne in 1614-37 and 1660-70. The River Lyon is a tributary of the River Tay and is approximately 30 miles in length. Elphinestone was a military engineer and topographer who worked in both Edinburgh and London. He became known for his maps of Scotland, which were the most detailed and accurate ever created and were used by both sides during the Jacobite Rebellion.